Gut health is something I’ve struggled with since birth. Adopting a paleo diet remedied the majority of issues I’d struggled with throughout my life which you can read more about here, but after coming off birth control 6 or so years ago, my gut health once again took a turn for the worst, helping to aggravate a long battle with hormonal acne. 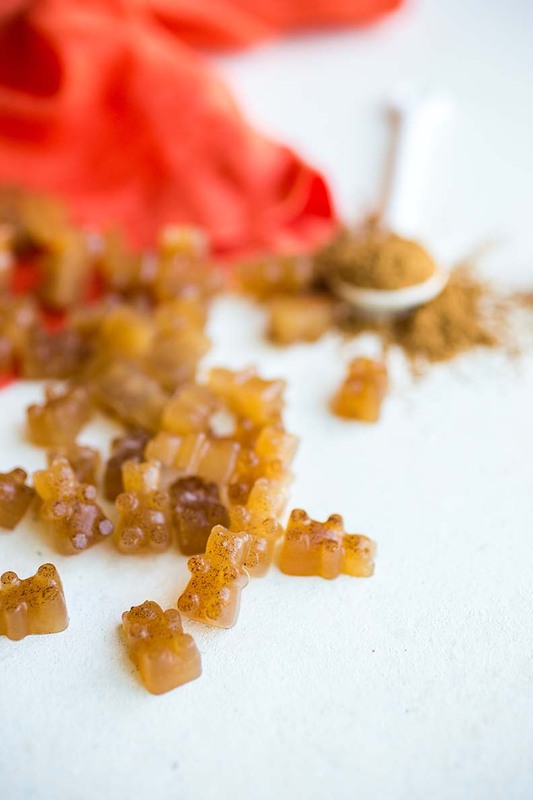 Although I’ve adopted a variety of strategies to address my gut health, one of my favorite gut-healing foods are gelatin-rich gummies. 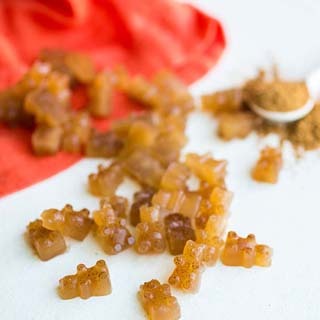 My favorite part about gummies is that you can really make them your own. I make different flavors and varieties of these all the time to mix it up. 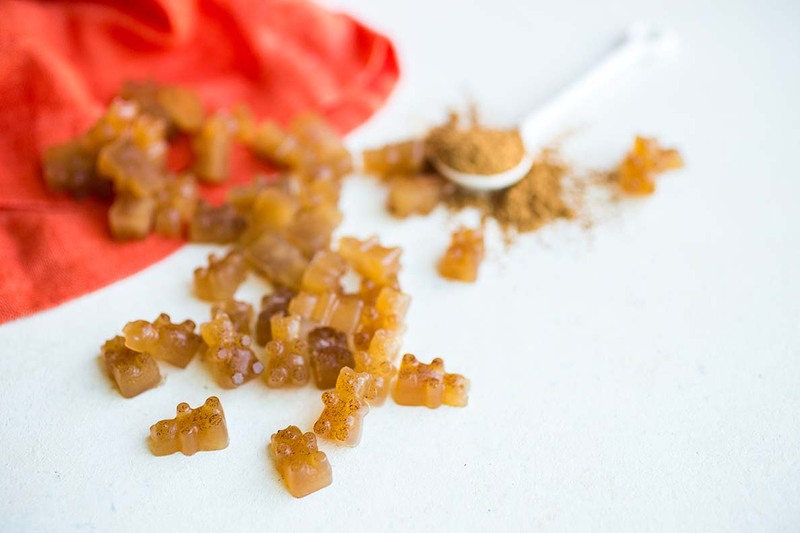 Because fall is in full swing, I decided to make a fall-inspired batch, hence these Apple Cinnamon Gummies! The best part about this recipe is that it only includes 3 ingredients and takes only a few minutes to prepare. The reason these are so great for gut-health is that they contain grass-fed gelatin. (This is the brand I use). Gelatin not only support gut health, but also strengthens hair, skin and nails. Pretty much a win-win. In order to make these, you’ll need a few candy molds. It completely doesn’t matter which kind you get. Personally, I have this one, these and this. Any of them will do! In a small saucepan, combine all ingredients over medium heat and immediately begin to stir with a wooden spoon. Continue to stir every 30 seconds or so until the mixture almost reaches a boil. Once you see the liquid start to bubble, remove from heat and gently pour into a candy mold of your choice. Place the candy mold on top of a baking sheet in order to make it easier to move around. Once the mold has been filled, move into the refrigerator to set. Once set, I like to move the molds into the freezer before attempting to remove the gummies. It makes them less likely to stick to the mold. 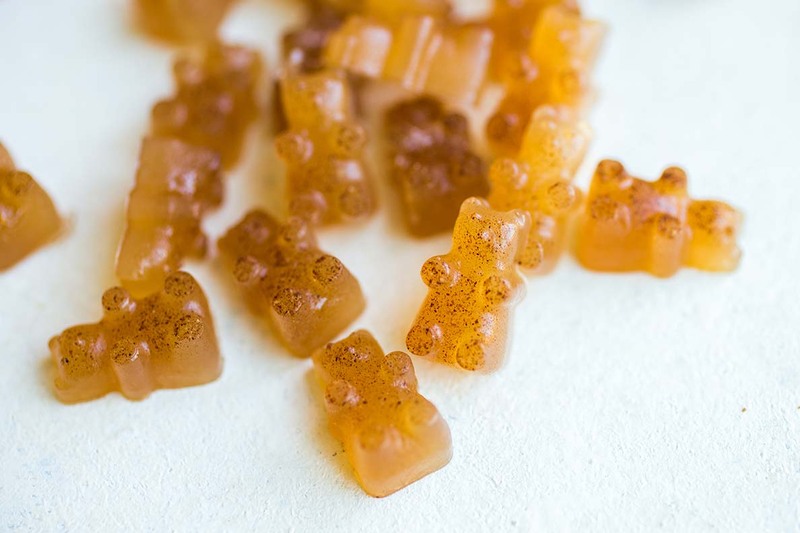 Once you've removed all of the gummies, store them in the fridge to have on hand throughout the week. These look great and super easy! How much is a serving and how long will the gummies last in the fridge? I’m ordering some gelatin right now to add these to my diet! And I want to thank you, Anya, for helping me find the root of my hormonal acne! I’ve learned so much from your posts! I love these gummies and so do my kids. I actually use organic apple cider and they are super tasty!